Across the atmosphere of Earth, lightning flashes about 50 times per second. That’s 4.3 million times a day and roughly 1.5 billion times a year. Using a new instrument on the International Space Station (ISS), scientists are hoping to observe and dissect at least a few of those lightning bolts every day. Launched to the ISS in August 2013, the Firestation instrument includes photometers to measure lightning flashes, radio antennas to measure the static (a proxy for the strength of the electrical discharge), and a gamma-ray electron detector. Firestation could observe about 50 lightning strokes per day as it looks for brief bursts of gamma rays that are emitted by some of them. Gamma radiation is usually associated with exploding stars or nuclear fusion, but scientists have found evidence that terrestrial gamma-ray flashes (TGFs) may occur in the atmosphere as often as 500 times a day. Atmospheric scientists are interested in the processes that trigger lightning within thunderstorms and what kinds of lightning produce gamma rays. TGFs may also be related to the atmospheric phenomena known as red sprites, electrical discharges that extend upward from thunderstorms. 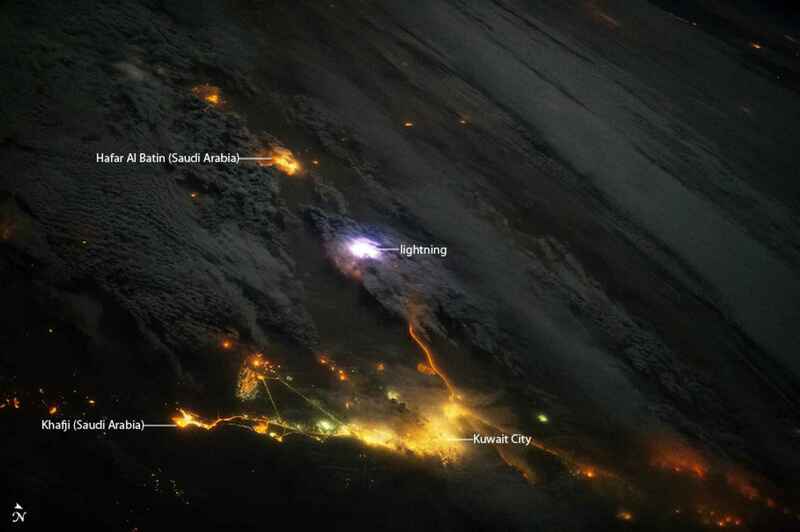 The photograph above, snapped by an astronaut aboard the International Space Station on December 12, 2013, shows a white flash of lightning amidst the yellow city lights of Kuwait and Saudi Arabia. 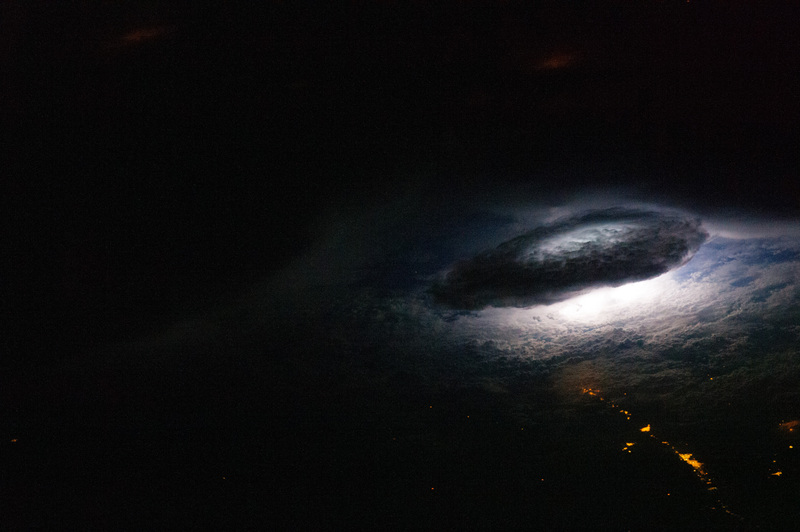 Another astronaut orbiting over Bolivia captured a close-up of a lightning flash beneath a thunderhead on January 9, 2011 (image below). In a few years, NASA scientists plan to add another lightning sensor to the ISS. The Lightning Imaging Sensor (LIS) was originally designed for the Tropical Rainfall Measuring Mission, which was launched in 1997 and is still flying. At the time, the research team from NASA’s Marshall Space Flight Center built a backup LIS in case of trouble with the main instrument. That spare is still quite functional and is scheduled to be sent up to the space station in 2016. LIS detects cloud-to-cloud and cloud-to-ground lightning, and it can detect discharges both in daylight and at night. It measures the rate and amount of radiant energy in global lightning strikes. Because the space station flies farther north and south than TRMM, this second LIS instrument will extend lightning measurements beyond the tropics.